Pennsylvania is a motorcycling state. The Insurance Institute for Highway Safety lists 390,493 motorcycles registered in the state in 2017, less than only California and Florida. 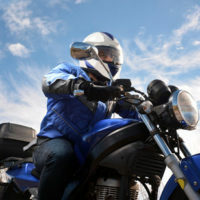 The amount of cycles on the roads unfortunately means, though, that more accidents will occur on Pennsylvania roads involving motorcyclists than would occur in a state where fewer cycles are registered. If you have been a victim of a crash involving a motorcycle, you may be able to obtain compensation for your bills. Like several other states, Pennsylvania is what is called a choice no-fault state, meaning that those who purchase auto insurance can choose either a ‘limited tort’ or a ‘full tort’ policy. A limited tort policy lets an injured person sue the allegedly responsible defendant only if their injuries are severe, while a full tort policy allows an injured person to bring suit regardless of the level of severity. Some drivers choose the limited tort option because they want to save on insurance premiums. However, an important fact to keep in mind for all motorcyclists is that Pennsylvania law has an exception for motorcycles and accidents involving motorcycles. The relevant Pennsylvania law states that the limited tort/full tort choice only applies to those vehicles which are termed “private passenger motor vehicles.” These vehicles are required to have four wheels – thus, a motorcycle does not fall under this classification. What this means is that any accident involving a motorcyclist will automatically be a ‘full tort’ situation – the motorcyclist can bring suit against an allegedly negligent driver regardless of what type of insurance they might hold. Even if you are able to bring a lawsuit against the allegedly negligent defendant, there are still criteria that have to be shown to the court in order to prevail in your case. You must be able to show that the defendant’s conduct breached the duty of reasonable care that all motorists on Pennsylvania roads owe to each other. You must show that the breach of duty caused you harm (not necessarily physical; conditions like PTSD can count as harm). You must also show that the breach of the duty of care that harmed you was due to the defendant’s actions. Be advised also that causation and fault may play a role in the total amount of your recovery, if you do obtain a jury award. Pennsylvania subscribes to the theory of comparative negligence, meaning that any recovery you receive will be reduced by whatever percentage is deemed to be your fault as the plaintiff. If, for example, you are deemed to be 20 percent at fault for your accident, your recovery will be 80 percent of the total amount granted by the court. Motorcycle accidents can be deadly, and even if no one is killed, the injuries can take months and years to heal. If you have been the victim of a motorcycle crash, you need a knowledgeable and compassionate attorney who will fight for your rights, even as bias against motorcyclists still persists in many hearts and minds. The Needle Law Firm’s dedicated Pennsylvania motorcycle accident attorneys are happy to sit down with you to try and help you figure out how to go forward. Call us today for a free consultation at 570-344-1266.